Learning how to seal a concrete balcony can save you from dealing with some serious home repairs. Concrete left unsealed is prone to moisture damage, cracks and failure, all of which can lead to major homeowner headaches. Concrete is pretty tough looking, particularly when new. This smooth, rock like substance appears to be strong and fairly indestructible. In reality, however, concrete is porous, which means that it can absorb liquid. This may not sound like a big problem, until you begin to consider the fact that rain, snow and ice are all liquids your balcony will be subject to. Add in some spilled wine on an evening out enjoying the view from your balcony and you've got quite a mess on your hands. Over time, the rain and snow your balcony absorbs will weaken the concrete structurally. Cracks will begin to appear in the surface, allowing even more moisture to seep in. When this water freezes, it expands, potentially breaking your balcony and making it unsafe for use. Sealing cement or concrete with an impregnating sealer stops this moisture absorption. The result is a balcony that is stain resistant, moisture resistant, easier to clean and less prone to cracks and damage. There are many types of concrete sealant on the market today, some with a silicone base and others with a water base. Both have their pros and cons to consider before purchasing. Silicone based sealers are more expensive than water based sealers, but they hold up longer and need to be reapplied less frequently. A sudden, unexpected rain shower the day after you seal your balcony with a silicone based sealer is nothing to fear the way it is with water based sealers. Silicone sealers do contain high levels of VOCs however, giving them a strong odor. Water based sealers are easier to apply than silicone based sealers, because they can be cleaned up easily in case of spills. While still wet and curing, the sealer can be broken down and washed away by more water, so an accidental spill to the ground below won't be such a large problem. Water based sealers need to be applied more frequently than silicone sealers, as often as twice a year in rough climates, but they do have lower VOCs which is better for the environment. Check your weather forecast; seal your balcony when you can be assured of good weather for two to three days while the sealant cures. Clean your balcony well. Use a scrub brush or a power washer and remove any debris, dirt or topical stains that you don't wish to preserve by sealing in place. Allow the balcony to dry completely. Use a paint brush to seal the edges and perimeter of the balcony. Seal between banister posts and railings and make sure to cover all visible areas of the concrete. Use a paint roller to apply the sealer to the rest of the balcony, painting yourself off the balcony and into the house as you go. Allow the sealer to cure for up to 48 hours before returning furniture to the balcony and resuming its use. Once your balcony is sealed, maintain it with a gentle cleanser to remove debris on a regular basis. Apply any concrete paint once the sealer has been cured and reapply sealer on a yearly basis for best results. Learning how to seal a concrete balcony may seem like a chore, but can save you a lot more work in the future. 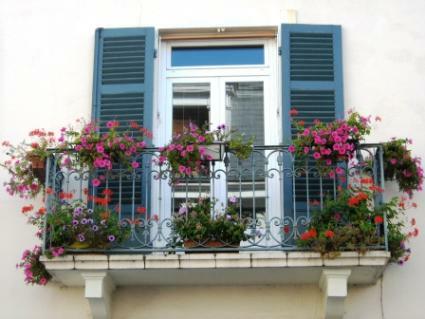 Care for your balcony properly and enjoy its use for years to come.